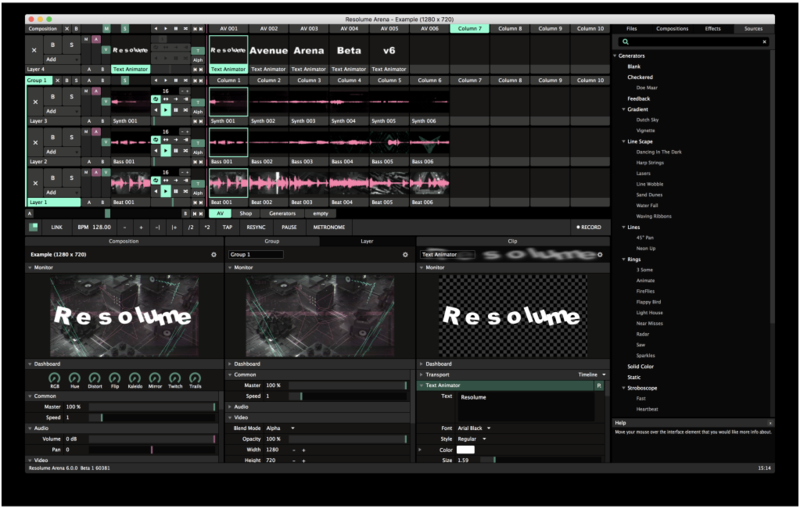 You can think of Resolume as the “Ableton of VJing” – a tool that lets you trigger visuals instead of musical patterns. And it just got a big upgrade. There are lots of ways to play and composite videos and animations live on a computer. What sets Resolume apart is its distinctive, horizontally layered interface. Resolume works in multiple layers (which now in 6 you can use as groups and employ as masks). Those layers are intuitively displayed horizontally, with corresponding clips in rows and scenes in columns. And to get you started easily, the software defaults to a easy-to-handle three layers. With scenes vertically and clips horizontally (90 degrees rotated from what you get in Ableton Live), you can then add per-clip effects and automation, all while making a composition in layers. It isn’t as open-ended as semi-modular environments like VDMX, and it’s not a from-scratch visual development tool like TouchDesigner or Max. It’s also not rigidly limited to a DJ-style mixing paradigm. Instead, it’s somewhere in between – somewhere that works really well for programming live visual shows to music. Resolume isn’t the only clip-oriented VJ tool, but it’s probably the most comfortable to people coming from Ableton Live (and it can even mix audio as well as video), with some adjustments to how you think. Since you’re dealing with image, not sound, the horizontal layers make more sense for optical composition than Ableton’s endless vertically-oriented mixer tracks. Oh, and – it’s cross-platform. That alone allows for some convenience. Layer groups and masking! Okay, this changes everything. Layers can have sub-groups, expanding that powerful layer metaphor. And a layer can work as a mask. So that changes how the whole tool works creatively. It’s easier to manage and trigger clips. This alone I think might be worth upgrading – or switching. Persistent clips and locked clips make it harder to lose or accidentally trigger clips, respectively. You can also trigger next and previous columns, for scenes of clips. That should work well as they say for theater shows and the like. This should be familiar to Ableton Live users, but it’s also an idea Mark Coniglio has championed in his software, including Isadora. It’s something we should see more of – perhaps missing simply because developers aren’t normally familiar with what it takes to run theater, dance, and other performances. There’s Ableton Link support. Easy networked sync with Ableton Live, iOS apps, desktop apps, other instances of Resolume – everything that supports the de factor Link sync standard, even without MIDI. The interface is easier to manage. Without making Resolume hyper-modular (like something like VDMX), the developers have at least given us more flexibility. You can drag things around, and the UI works better on bigger screens. Most importantly, previews are more visible. Standard features from other tools are there, too. A more-standard color palette, browser and media manager (à la Ableton etc.) are included. You can make animated envelopes. A new editor, with presets, allows for more sophisticated envelopes – and might turn Resolume into a replacement for motion graphics software for a lot of quick jobs. That’s not all, but those are the things that I think will be the most relevant to the most users. We’ll have a review on CDM. And yes, Resolume 6 (and some other news this fall) means — it’s time to bring back Create Digital Motion.